Experience the classic cruiser that provides your ticket to escape, the Victory Boardwalk™. This cruiser puts you in a relaxed position so you're ready to get away and enjoy the ride. The Boardwalk rolls on 60-spoke, chrome laced wheels that complement the bike’s extensive chrome and add timeless style. Whitewall tires further define the Boardwalk’s distinctive cruiser style. The Boardwalk is the epitome of versatility. Remove the passenger seat and it’s a sporty solo rider. Or add Lock & Ride® accessories - in minutes, without tools - and the Boardwalk is ready for a day trip or overnight for one or two riders. It’s a convertible cruiser. Go solo or share the Boardwalk experience. Add Victory accessories and customize your Boardwalk to make it all yours. All Victory accessories undergo the same rigorous testing as our motorcycles, so they install easily, fit properly, and deliver outstanding performance. The Victory Boardwalk features relaxed, ultra-comfortable ergonomics. It all starts with the beach bars, which put a rider in a position that’s cool, comfortable and in control. And their bright chrome finish enhances the bike’s great style. From the laced wheels to the beach bars to the exhaust, there is extensive chrome the full length of the Boardwalk. The beautiful chrome is an ideal complement to the Boardwalk’s stylish new Sunset Red & Gloss Black paint. The Boardwalk seats provide riders with the ideal blend of cushion and support. The front seat puts a rider in a relaxed cruising position, and the passenger is treated to a comfortable seat and well-placed footpegs. The passenger seat can be removed easily to give the Boardwalk a stylish solo cruiser look. When a Boardwalk rider stretches out to enjoy the ride, spacious floorboards provide a comfortable perch for the feet. The floorboards enhance a rider’s comfort and confidence. They put a rider’s feet and legs in a comfortable position and provide easy access to lower controls. The Victory Freedom® 106 / 6 drivetrain is smooth, efficient - and extremely powerful. 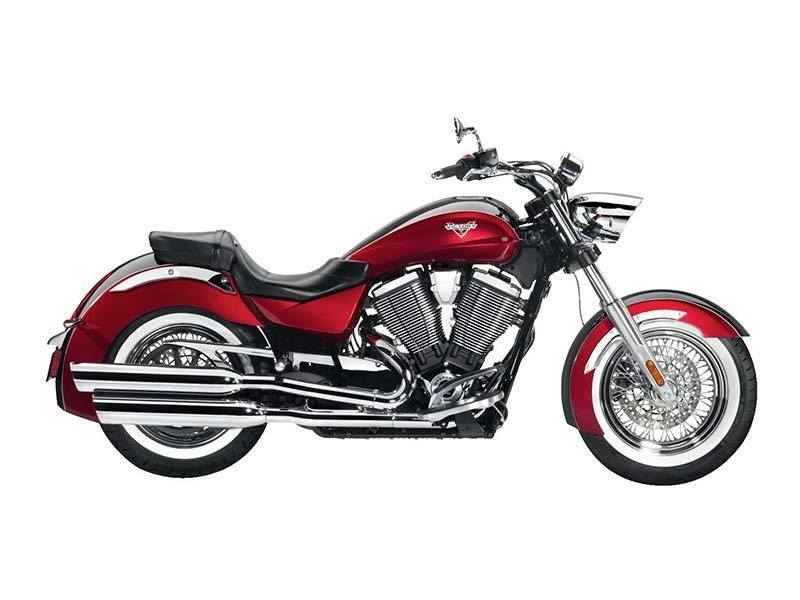 The fuel-injected, counter-balanced, 106 cubic inch V-Twin delivers 110 foot pounds of torque you can use for great cruising or negotiating city traffic. The Victory six-speed transmission has sixth gear overdrive that drops the RPMs and delivers the smooth ride you’ve been looking for. Stunning and stylish full fenders wrap around the tires, giving the Boardwalk the look of a custom cruiser. A distinctive raised spine runs the length of the bike on the fenders and fuel tank to give the Boardwalk unique custom style.